Kane is carrying the Blackhawks into the playoff conversation. The Chicago Blackhawks have crept back into a very congested playoff race in the NHL’s Western Conference. While they still have some significant hurdles to climb to reach even a potential Wild Card spot, their 7-2-1 record over their last 10 games is enough to at least make things interesting. Chicago’s disappointing season leading up to their recent surge has masked what has been an outstanding season by forward Patrick Kane. In fact, Kane’s year could become one of the best in his storied 12-year career and deserves to be in the MVP discussion. Things got off to a great start for the 30-year-old forward. Kane posted 11 goals and seven assists for an impressive 18 points in the first 12 games of 2018-19. Unfortunately, things took a turn in November as his offensive numbers dried up some to the tune of two goals and nine assists in 13 games. The months of December and January saw Kane regain his scoring touch, picking up a combined total of 16 goals and 26 assists for 42 points in 25 games. On the year, Kane has 33 goals and 81 points through 55 games, placing him among the league leaders for most points in 2018-19. He even briefly tied the unstoppable Nikita Kucherov of the Tampa Bay Lightning for the points crown, though Kucherov has since pulled ahead by three points with a game in hand. Compared to the rest of his career, Kane is on pace to have a season to remember. He has already bested last year’s numbers (27 goals and 76 total points) in 55 games this season. The 2015-16 season was the best of his career with a high of 106 points in 82 games. That 1.29 point-per-game pace he held during that season is actually lower than his 1.47 point-per-game pace he’s currently maintaining this season. Kane has hoisted the Blackhawks on his back and carried them back into fringe contention. He has done so by playing a ton of minutes normally reserved for players under the age of 30. He has the fourth-most total minutes of any NHL forward, trailing players who are all at least five years younger. He is averaging over 22 minutes per game, a career high. How has he been able to avoid wearing down despite the increased workload? An altered summer training regimen might be the answer. 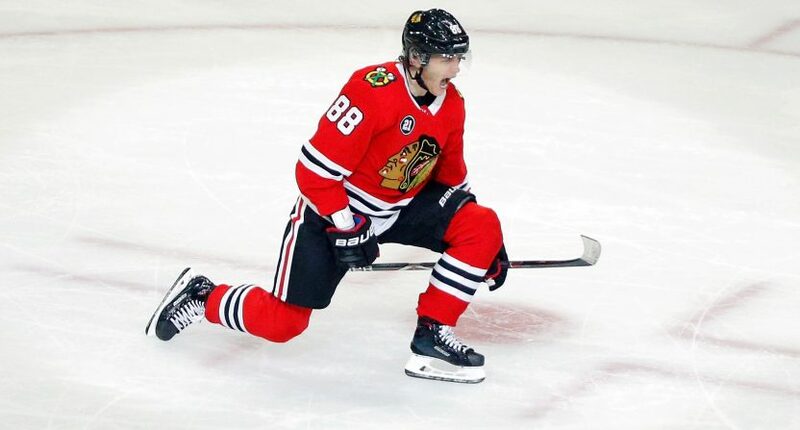 The Chicago Sun-Times reports that Kane placed a larger emphasis on speed and agility prior to training camp. Clearly, Kane’s offseason efforts are paying off. His speed and acceleration have been a couple of the key reasons behind his surging point total. His increased workload has granted him more opportunities that he’s capitalizing on. He has already attempted 397 shots, which is well on pace to beat his career high of 496. Looking at PDO, a stat that combines a team’s shooting and save percentage while a player is on the ice, Kane is sitting at 102.3. With 100 being the usual distinction between good and bad, Kane is holding his own even with increased minutes and a roster that’s not as stacked as it once was during Chicago’s more formidable years. The Blackhawks wouldn’t be within reaching distance of a playoff spot without Kane’s incredible efforts this season. MVP considerations are rarely given to a player who doesn’t reach the playoffs, meaning Kane could be further overlooked unless his team pulls it together down the stretch. That’s unfortunate as his play this season may be the key reason Chicago is even in the playoff conversation, and his final numbers could become the best of his career. Don’t let the Blackhawks’ flaws as a team take away from what is becoming a truly remarkable season for one of the game’s best.